Thomas Gray, Chief Clerk of the Wreck Department of the Board of Trade in London, visited Barra in 1866, and wrote a damning report about the treatment of wrecks and other matters. He was told about the plundering of the Annie Jane’s survivors’ possessions. 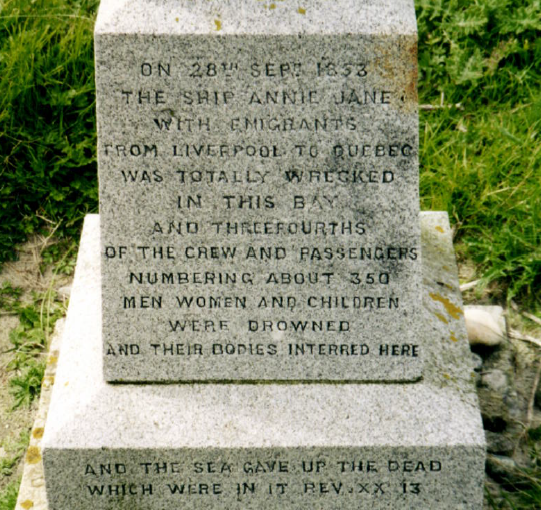 Extract taken from, The Wreck of the Annie Jane. Despite Gray’s wish for a monument or fence around the spot where so many bodies were interred, it would remain unmarked for almost twenty years. In 1881, a granite memorial was put up on the spot by a private individual where it still stands in a commanding position above the beach.